Symptoms of Hyperparathyroidism and Symptoms of Parathyroid Disease. Do I have just one? Most people with parathyroid disease (hyperparathyroidism) will have symptoms when they are diagnosed, and nearly all will develop symptoms if left untreated. Parathyroid disease affects the brain, bones, kidneys, gastrointestinal tract, nerves, muscles, blood vessels, and heart. It may even increase the risk of certain cancers. What are the symptoms of hyperparathyroidism? The most common symptoms of hyperparathyroidism are chronic fatigue, body aches, difficulty sleeping, bone pain, memory loss, poor concentration, depression, and headaches. Parathyroid disease also frequently leads to osteoporosis, kidney stones, hypertension, cardiac arrhythmias, and kidney failure. This is a devastating condition if left untreated. Hyperparathyroidism is a serious disease that becomes very destructive with time. Over time, it can lead to problems throughout the body, including osteoporosis, high blood pressure, kidney stones, kidney failure, stroke, and cardiac arrhythmias. Because it is a serious and progressive disease, patients with parathyroid disease should undergo parathyroidectomy, an operation to remove the parathyroid tumor. The symptoms of hyperparathyroidism are different in different people. Sometimes people have symptoms making them miserable within the first year or two of having high blood calcium. Other times it can go 6-8 years without causing too many problems. Eventually, almost everyone will develop symptoms or complications of this disease (read our blog on this topic). Although it is benign, it will slowly destroy your body and take away the "joy of life" while it does so. The good news is that it can be cured with a simple operation done by an experienced surgeon. Kidney stones (We have an entire page on kidney stones). Most people with hyperparathyroidism will have 5 - 6 of these symptoms or signs. Some will have lots of them. A few people will say they don't have any... but after an operation they will often say otherwise. In general, the longer you have hyperparathyroidism, the more symptoms you will develop. Not sure if you have a parathyroid problem? Download the CalciumPro App developed by our expert doctors. The app will graph and analyze your lab tests, help you diagnose hyperparathyroidism, and save you lots of doctor visits. Was top 3 medical app of 2014, 15 and 16. We know that there is a lot of information on the site and it can be hard to take it all in. If you have a question for our surgeons, please contact us using this form and we'd be happy to help. If you have hyperparathyroidism, go through this list with your family members. Very frequently they will notice subtle changes in your personality over the past couple of years. Often they will say that you have become tired and run-down, without the energy of your old self. They will also confirm that you have become a little more "cranky" over the past couple of years. Have an honest discussion with them and you will be surprised what you may learn. You may realize that the reason for these changes in your personality is that you have a parathyroid tumor that is causing your brain and nervous system to react to the high calcium. The best news is that hyperparathyroidism can usually be fixed in 20 minutes or less. A simple, out-patient procedure can change your life. This section on parathyroid symptoms cannot be stressed enough. Symptoms are seen at all high calcium levels. The severity and type of symptoms patients get are NOT related to the height of the calcium. To put it another way: how high your calcium is does not correlate with how severe your symptoms are. It is the duration of high calcium levels (e.g. above 10.0 in adults over 40) that are associated with the complications of hyperparathyroidism. How high above normal the calcium is has nothing to do with it. This graph was produced in 2012 from our last 16,000 patients at the Norman Parathyroid Center. Each of these patients had a parathyroid tumor removed from their neck. There are 16 symptoms of hyperparathyroidism (some symptoms listed above are generalized and overlap each other). This graph shows how many symptoms the average patient had (on the vertical y-axis) and what their blood calcium was (on the bottom x-axis). The black dots are the average number of symptoms all patients had at each calcium level. The thin vertical lines are statistical error bars showing that there is some variability... a few patients at every calcium level had zero symptoms, while a few patients at every calcium level had all 16 symptoms. People with higher calcium levels do not have more symptoms. So if your doctor says "your symptoms can't be from hyperparathyroidism because your calcium is not high enough", then you print this graph and educate them. The number of symptoms a patient has is NOT related to how high the calcium level is. UPDATE: In January 2017 we published the largest study of parathyroid patients of all time (20,081 consecutive adults). We looked at the symptoms and the complications (stones, osteoporosis, etc, etc) in patients that have very high calcium and compared them to parathyroid patients with only very mild elevations of calcium. The two groups were those with hyperparathyroidism with calcium levels below 11.0 mg/dl (2.75 mmol/l) and those with calcium levels above 11. The result: NO DIFFERENCE! People with calcium levels of 12.5 do NOT have more symptoms, or stones, or osteoporosis, or fatigue (or anything) than people with calcium of 10.5. A calcium of 12.5 is not worse than a calcium of 10.5. It's all about the duration, not the height. Read and print the entire article here. This is a great article for you to print and educate your doctors with! Our Hypercalcemia page has a cool Hypercalcemia Calculator that will give the exact upper limit of normal calcium for your age. Another extremely common problem is that patients will go to their doctor with one (or often several) of the symptoms listed on this page. The doctor will run some tests and nothing shows up. The doctor then says "Everything is fine. Your lab work is all fine except for a slightly elevated calcium level which can't be the problem. Let's just wait for 6 months and check it again". This often goes on for years until eventually somebody decides to look into the high calcium, or incredible as it seems, the patient changes doctors and the new doctor says "Hey, what the heck are we doing about all these high calcium levels?". This doctor gets it! 26% of our last 20,000 cases of hyperparathyroidism were diagnosed when that patient went to a new doctor--on their first visit!. Again, we want to stress the fact that almost all patients with high calcium will have some of the symptoms listed on this page. How bad these symptoms are is not necessarily related to how high your calcium is elevated. If it's elevated a little bit (around 10.7), you may be depressed, forgetful, constantly tired, etc, etc. You do not need to have a calcium of 12 or higher to get symptoms. To illustrate this point, during the month of February 2010 Drs Norman and Politz operated on 195 patients with hyperparathyroidism. Three had already had a stroke. One stroke patient had calcium levels around 12.8. The other two never had a calcium level above 11.7, but they had calcium levels over 10.1 for 12 years. Similarly, 36 of the 195 parathyroid patients that month already had kidney stones. Half of them never had a single calcium level above 11.3. Tiredness and/or depression was seen in 82% of all the patients during this month, yet 3/4 of them never had calcium levels above 11.3, some never had a calcium level higher than 10.8. Ninety percent of these patients had osteopenia or osteoporosis, yet this was not predictable by how high their calcium was. Again, the symptoms you get--even the bad complications like kidney stones, heart problems, stroke, cancer, kidney failure, and osteoporosis are NOT related to how high your calcium levels are. So if your doctor says "lets just wait and see what happens since your calcium is not that high"--that is when you print this page and take it to him/her and educate them! This is bad advice. A high calcium level, regardless of how "high" it is, is not normal and your body will not like it. Waiting until your calcium goes above 11.5 is absolutely the worst advice you could ever get (malpractice?)... and is given by doctors who don't know much about this disease. Let's face it... most doctors might see hyperparathyroidism once in a blue moon. Even endocrinologists will see diabetes patients all day long, and see one parathyroid patient every couple of weeks or months. They are extremely up to date on diabetes and thyroid disease because they see this daily. Sadly, there are some endocrinologists that are not up to date on parathyroid disease. It's probably because they don't see it very often. Patients with hyperparathyroidism have a higher rate of: stroke, heart failure, heart attack, atrial fibrillation, cardiomyopathy, renal failure, depression, shingles, kidney stones, osteoporosis, serious bone fractures, bone pain, need for hip replacement, GERD, high blood pressure, memory loss, chronic fatigue, MGUS, anemia, hair loss (females), cancers of the breast, colon, kidney, and prostate, and early death. Because of these increased risks, experts now believe that it is best to remove the tumor when the diagnosis of hyperparathyroidism is made, rather than wait until one or more of these complications arise. However, when the parathyroid tumor is removed, the risks of these complications decreases. The days of "watching" the high calcium for a while are long gone. Remember - It is almost never normal to have a high blood calcium level. It is well known that almost all people with parathyroid disease will have obvious parathyroid symptoms, while some aren't quite so sure they have any. For this latter group (about 2-5%), it can only be known several months after the operation to remove the bad parathyroid gland. Almost all of those patients who thought they didn't have any parathyroid symptoms preoperatively will claim to sleep better at night, be less irritable, and find that they remember things much easier than they could when their calcium levels were high (nervous system problems). Just ask your family members if you have become more irritable or cranky over the past couple of years! The most common symptoms are those listed at the top of the list... with about 75% of people with hyperparathyroidism having 4 or 5 of the first 6 listed. MOST people will have several symptoms--the average person will have between 4 and 6 (see the dots on the graph above). Also be aware that the symptoms that people get are somewhat different depending on their age (teenagers get different symptoms than people in their 60's). Read more about the age differences in parathyroid symptoms on our age page. Important: when young people get hyperparathyroidism, their symptoms are usually different than when a parathyroid tumor develops in older people. In many cases, it's the spouse or children who has detected a change in personality over the past several years -- "He/She is more cranky than he/she used to be; he/she has a shorter fuse and is quicker to anger than he/she used to be". In some cases, its ONLY the spouse who notices a big difference in the patient with the parathyroid problem, while the person with the parathyroid problem will claim they don't see much difference in their personality. After the parathyroid operation, spouses typically comment that their husband or wife sleeps better, can remember things better, and is easier to get along with -- "After the operation, he/she quickly returned to his/her old self again!". As Dr Norman says: "A good parathyroid surgeon can save a lot of marriages!" In several medical studies, as many as 98% of parathyroid patients claim to feel better after removal of a diseased parathyroid gland, even when only 90% claim they felt "bad" before the operation. FATIGUE IN PATIENTS WITH HYPERPARATHYROIDISM. The number one symptom that people with hyperparathyroidism complain about is fatigue. Just over 82% of our last 28,000 patients said this was their main problem. Many patients are diagnosed with parathyroid disease because they went to their doctor saying "I'm tired all the time, something must be wrong". Often the doctor will say "I can't find anything wrong", but the patient says "I know my body, and I'm telling you, something is wrong!" Many will say that they noticed "something changed last year", or "for the past 4 years I've been tired and I just thought it was menopause". A lot of people with hyperparathyroidism say that they are ok in the morning, but by noon they just can't get going any more. They can't stay motivated past noon or 1 o'clock in the afternoon. This all makes sense when we understand that our nervous system runs on calcium and when the calcium is high in the blood, this makes our nerves conduct electricity a bit slower--we interpret this as tiredness, fatigue, poor sleeping, poor memory, and other issues regarding how we feel. Almost all patients with a parathyroid tumor will feel remarkably better a week or two after the tumor has been removed. Most say "it was like the fog was lifted from me overnight". Read our testimonial page to see what other parathyroid patients say about this. This is the best part of our job... our patients love us because we give them back their energy and their "joy of life". BONE PAIN IN PATIENTS WITH HYPERPARATHYROIDISM. Patients with persistently elevated calcium levels due to overproduction of parathyroid hormone can also have complaints of bone pain. Bone pain is due to the activity of the parathyroid hormone on the bones, causing the calcium to be pulled OUT of the bones. In the severe form of parathyroid disease--or parathyroid disease that has been present for several years, bones can give up so much of their calcium that the bones become brittle and break (osteoporosis and osteopenia). This problem is even more of a concern in older patients. Bones can also have small hemorrhages within their center which will cause bone pain. This is why many patients with parathyroid disease will have a DEXA bone density scan performed by their doctor. The doctor is looking to see how much calcium has already been lost due to the excess parathyroid hormone. Although mini-parathyroid surgery has made it so ALL patients with parathyroid disease should be operated on for cure, those with osteoporosis or a decrease in bone density really should have it done! Also... If you have this disease and have not had a DEXA bone density scan--you need to get one. This will allow us to determine how much bone calcium you have lost and how best to get it replaced. Parathyroid.com has a complete page on osteoporosis due to parathyroid disease (click here). Does everybody with hyperparathyroidism get osteoporosis? YES, some faster than others. Some people will have osteoporosis when they are 25 years old if they have a parathyroid tumor. Heck, where do you think all the extra calcium in the blood and urine comes from? It's coming from your bones! Get the Calcium-Pro App FOR SMART PHONES AND TABLETS. The experts at the Norman Parathyroid Center developed an app that will diagnose your hyperparathyroidism, tell you what tests you need and which ones to avoid, and tell you what your risk of heart disease, high blood pressure, kidney stones and even your increased risk for several cancers based upon your calcium, vitamin D, and parathyroid hormone levels. Get this Award-Winning app. It is smarter than your doctor. DEPRESSION IN PATIENTS WITH HYPERPARATHYROIDISM. Another frequent symptom of parathyroid disease is depression. Just under 48% of our last 22,000 patients were either diagnosed with "depression" or were put on an anti-depressant within the previous 2 years. The vast majority of patients have some depression symptoms such as lack of energy, sadness, inability to sleep well, anxiety, nervousness, irritability, (etc) that their doctor felt was consistent with the diagnosis of "depression" so they were put on an anti-depressant medication (examples: Effexor, Zoloft, Paxil, Prozac, Lexapro, Wellbutrin, Celexa, etc). Thus, because hyperparathyroidism is a rare problem, most doctors are not aware that depression, tiredness, lack of energy, etc are some of the most common symptoms of this disease--so they treat the symptoms instead of treating the disease! Sadly, your doctor can miss the proper diagnosis of hyperparathyroidism because they don't see this disease very often (or they don't recognize it when they see it!). Read our blog on this topic, you will see common stories of the symptoms of hyperparathyroidism. IMPORTANT, almost all parathyroid patients that have been given the diagnosis of depression and have been put on one of these drugs can be taken off of the antidepressant medication after the operation. You should wait about 2 months after the operation for your hormones and calcium levels to stabilize, and then work with your doctor to see if you can be weaned from the drugs. Almost all can. But, don't do it on your own, do this with your doctor's help. ACID REFLUX (GERD) IN PATIENTS WITH HYPERPARATHYROIDISM. Just like anti-depression medications, many parathyroid patients have been prescribed an anti-stomach acid medication because acid reflux (GERD) is common--seen in about 62% of parathyroid patients. This is expected to go away after the parathyroid tumor has been removed... the high calcium causes increased acid production, so fixing the calcium usually fixes the stomach acid problem completely. Sometimes the acid production can be so severe that it causes an ulcer which bleeds--requiring emergency surgery. Interestingly, relief of GERD symptoms and acid reflux is usually dramatic after parathyroid surgery. Most people have complete resolution of this problem within 1-2 weeks of removal of the parathyroid tumor...never to need their Pepcid, Prevacid, Axid, Protonix, Aciphex, Prilosec, Zantac, Tagamet, etc, etc, ever again. The quickness of this cure is sometimes amazing, but can occasionally take a month or two. We have a blog on GERD and the cure rates after surgery. HIGH BLOOD PRESSURE IN PATIENTS WITH HYPERPARATHYROIDISM. High blood pressure is another symptom of hyperparathyroidism. As many as 75% of patients with parathyroid disease will have high blood pressure (hypertension). Sometimes it is hard to control and the patient has been put on 2, 3, and sometimes 4 drugs in an attempt to control it. Sometimes it's just one blood pressure drug, but at a time in the patient's life when blood pressure problems should not be showing up. The good news, however, is that fixing the parathyroid problem (having the little parathyroid tumor removed) will make the blood pressure problem go away completely or get better in almost everybody!! So, if you have hypertension, after your parathyroid tumor is removed, you and your doctor can expect to decrease the medications that you are on, and possibly even get rid of one or more of them! If you are on Atenolol, Lisinopril, Toprol, Enalapril, or another high blood pressure medication and your calcium is high... then you have this disease and need your tumor removed. Usually the resolution or decrease in severity of blood pressure occurs gradually during the first 2 weeks to 2 months following successful parathyroid surgery. You should not stop taking your blood pressure medications on your own... but you MUST talk to your doctor about re-assessing your blood pressure with full expectation of being able to 1) remove the only drug you are on, 2) remove one or two drugs if you are taking three drugs, or 3) decreasing the dose of each drug you are on. Almost ALL patients with high blood pressure will be able to decrease or stop one or all of their blood pressure drugs--but this MUST be done with the supervision of your internist or primary care doctor. Do NOT do this on your own. KIDNEY STONES IN PATIENTS WITH HYPERPARATHYROIDISM. Another common presentation for persistently elevated calcium levels due to parathyroid disease is the development of kidney stones. Since the major function of the kidneys is to filter and clean the blood, they will be constantly exposed to high levels of calcium in patients with an over-active parathyroid gland. The constant filtering of large amounts of calcium will cause the collection of calcium within the renal tubules leading to kidney stones. In extreme cases of long-standing parathyroid disease, the entire kidney can become calcified and even take on the characteristics of bone because of deposition of so much calcium within the tissues. Not only is this painful because of the presence of kidney stones, in severe cases it can cause kidney failure. People with kidney stones are almost guaranteed to have one big parathyroid tumor (not 4 bad glands), so these are usually easy, quick operations for the really experienced endocrine surgeon. Kidney stones are seen in only 24% of patients with hyperparathyroidism. Men with hyperparathyroidism have twice the risk of developing kidney stones as women. People with hyperparathyroidism under the age of 40 have twice the risk of having kidney stones than people over the age of 40. If you have kidney stones you must check your blood calcium AND your PTH levels. You will continue to get stones if you don't remove the parathyroid tumor. We have an entire page dedicated to kidney stones. It is very informative. CARDIAC SYMPTOMS OF HYPERPARATHYROIDISM. Heart problems are often seen in patients with parathyroid disease because hyperparathyroidism CAUSES heart problems. Besides high blood pressure which will affect well over half of people with hyperparathyroidism, the heart is often affected in other ways. About 6 % of people with parathyroid disease (hyperparathyroidism) will discover their parathyroid problem after they show up in the emergency room with a racing heart or heart palpitations. These arrhythmias typically will be treated with a drug called a beta blocker (like Atenolol or Inderal). Removing the parathyroid tumor will almost always cure the arrhythmia (racing heart) and allow the patient to be taken off of these medications within a month or two of the surgery (don't do this on your own... make sure your doctor follows you for this). Your doctor may not be aware of the relationship between hyperparathyroidism and cardiac (atrial) arrhythmias--so print this page and take it to them. If you have this problem, it will almost always resolve following successful parathyroid surgery. Again...DO NOT stop these important drugs without the help of your doctors. Atrial fibrillation (racing heart beat) is seen in about 3% of humans over the age of 70. They see a cardiologist and are usually on a medication for this and are given a blood thinner called Coumadin (Warfarin). HOWEVER, when patients over the age of 70 have hyperparathyroidism, their chance of having atrial fibrillation is 18%--more than 5 times higher. In patients over the age of 80 with hyperparathyroidism, 45% will have atrial fibrillation. We operate on patients over the age over 80 virtually every day for this reason. Atrial fibrillation is a common complication of high calcium levels in patients over the age of 65. Below that age, some patients will feel like they can sense their heart racing at times. This is called "heart palpitations". This is due to high blood calcium. We have a story about A-Fib on our blog--read it to learn more (cool stories on our blog!). The CalciumPro app will tell you what your risk of A-Fib is. Another cardiac problem that is often seen with parathyroid disease is the development and worsening of heart valve problems such as mitral valve prolapse. Patients with primary hyperparathyroidism (PHPT) show a high incidence of left ventricular hypertrophy, cardiac calcification within the myocardium, and/or aortic and mitral valve calcification and thus may carry an increased risk of death from circulatory diseases. After surgery the calcium and PTH returns to normal, the progression of heart disease stops, and the patient decreases their risk of developing severe aortic and mitral valve stenosis (blockage). To read more about this click here and a new window will open showing a journal article on this topic.... Here is the first line from this article: "Patients with primary hyperparathyroidism (PHPT) show a high incidence of left ventricular hypertrophy, cardiac calcium deposits in the myocardium, and/or aortic and mitral valve calcification and thus may carry an increased risk of death from circulatory diseases". Here is a very short list of major articles showing how hyperparathyroidism adversely affects the heart and increases heart related deaths. Nearly all of these articles shows that removing the parathyroid tumor will reverse some or all of the heart damage. This is a very short list. Clicking on the link will open a new window that will show you the article. Close the window to come back here. Left ventricular structure and function in primary hyperparathyroidism before and after parathyroidectomy. Cardiology. 2000;93(4):229-33. Cardiac abnormalities in patients with primary hyperparathyroidism: implications for follow-up. J Clin Endocrinol Metab. 1997 Jan;82(1):106-12. Maintained normalization of cardiovascular dysfunction 5 years after parathyroidectomy in primary hyperparathyroidism. Surgery. 2005 Jun;137(6):632-8 CONCLUSION: Parathyroidectomy can induce long-lasting improvement in regulation of blood pressure, left ventricular diastolic function, cardiac irritability (ventricular extrasystolic beats), and other signs of myocardial ischemia, with potential implications for the postoperative life expectancy of patients with primary hyperparathyroidism who have undergone parathyroidectomy. We have a blog on this, with over 30 references. HEADACHES IN PATIENTS WITH HYPERPARATHYROIDISM. Many people with parathyroid disease have recurrent headaches. About 5% of people with parathyroid disease will present with headaches being the major reason they go to the doctor... and after time and money is spent on CAT scans and MRI's of the brain... all the doctor is left with is a high calcium level in the blood. Then the doctor will say: "I'm not sure if the high calcium is causing this or not, let's check some more labs". Au contraire!... the calcium IS causing the recurrent headaches and removing the bad parathyroid gland will fix the headaches. Also, it is interesting to note that almost all patients that have recurrent headaches as a symptom of hyperparathyroidism have one big tumor as the cause... and it's usually extremely easy to fix (less than 20 minutes most of the time). Headaches as a presenting symptom are most common in young people. In teenagers, and those in their 20's and 30's, recurrent headaches are the number 2 symptom! (number one symptom in young people is kidney stones). The good news is that removing the parathyroid tumor will stop the headaches usually within 2 weeks! LIFE EXPECTANCY IN PATIENTS WITH HYPERPARATHYROIDISM. Long-standing parathyroid disease can be very hard on the body, In fact, people with parathyroid disease for more than 15 years have a life-expectancy which is about 5 years less than their peers. In other words, studies have shown that all of these complications add up over the years, and these parathyroid patients tend to die about 5 years faster than they would otherwise. It is not a cancer, but parathyroid disease and too much parathyroid hormone can be very hard on your body! Now its easy to understand why having a mini-operation to remove a bad parathyroid has changed the way this disease is treated. Life insurance companies know this and can deny you coverage if you have hyperparathyroidism. See a typical letter from one of the biggest life insurance companies. Editor's note: September 3, 2015. Recently we operated on 2 very nice ladies, one 65 and the other 71. Both had a stroke within the past 3 months that was directly due to their parathyroid disease not being treated. Both lost function in 1/2 of their body. Both had parathyroid disease for over 12 years and their doctors told them "don't worry about it until your calcium goes above 12". Neither one of these ladies ever had a calcium above 11.9. Their calcium was usually around 10-9 to 11.4. They both had blood pressure that was very hard to control. Both had bad osteoporosis. Both had severe GERD. Both were tired all the time. Their doctor kept saying to wait. Well they waited until they had a stroke. The sad part is that we see this terrible complication about every month or so. This disease could ruin your life if you don't get it treated. It may make you feel bad, make you tired, jeopardize your marriage (your spouse will get tired of arguing with you! ), give you kidney stones, take away your joy, and even might cause you to have a stroke (this is very rare). Both of these ladies had their parathyroid problem fixed via a mini operation that took 17 minutes TOTAL... and had a Band-Aid on their neck when they went home an hour or so later. Be careful of a doctor that tells you to wait until your calcium goes higher. It will almost always NOT go higher... waiting will not necessarily make the calcium go higher because all the calcium goes out in your urine. Waiting until it goes higher is usually not in your best interest. Find an expert and get the tumor removed. We have a blog article on the risks of high calcium... more deadly than high cholesterol. A very good read. OSTEOPOROSIS IN PATIENTS WITH HYPERPARATHYROIDISM. Everybody who has hyperparathyroidism will lose calcium out of their bones and thus lose bone density. This loss of bone density is called "osteoporosis" and is such an important part of parathyroid disease that it has its own page on this web site (click here). Let us say this again... EVERYBODY with hyperparathyroidism will develop osteoporosis if the parathyroid tumor is not removed. About half will get SEVERE osteoporosis. Fosamax and Evista will NOT change this! Even 25 year old men get osteoporosis if they have a parathyroid tumor that is not removed. THEREFORE, ALL patients with parathyroid disease MUST have a bone density scan to determine how much damage has been done to their bones. It does not matter if you are a teenager or in your 20's---if you have hyperparathyroidism then you must get a DEXA bone density test. After all, where do you think all that calcium in your blood and in your urine came from??? It came from your bones! Almost all patients with hyperparathyroidism with kidney stones have osteopenia or osteoporosis. Yep, those kidney stones came from your bones! Read more on our osteoporosis page. How long after the parathyroid tumor is removed until my symptoms of hyperparathyroidism go away? This is a common question. The answer is a little bit obscure, but certain things are very clear. Virtually all patients feel better and "enjoy life" more after the parathyroid tumor is removed. Bone Pain. This almost always resolves within 1 to 4 hours. This is very dramatic in almost all patients with bonepain. High Blood Pressure. Usually hypertension improves in the months following the operation, and you may be able to taper off some of your blood pressure medications. Do NOT do this yourself, you MUST let your doctor help you gradually get off of these drugs. Central Nervous System (brain) Symptoms. There are quite a few symptoms related to the brain and how the brain does its business (fatigue, depression, memory loss, anxiety, low energy level, short temper, sleeping problems). Fatigue and low energy usually improves in the first few weeks after the operation, but can take longer. Depression and memory loss usually take a few months to get noticeably better. Some people get dramatic changes in these symptoms within 1-2 weeks, but most get relief in a very gradual fashion over several months. Often it is their spouse/family that notices the patient is doing things differently and appears much happier. Depression takes longer to resolve, so if you are on an anti-depression medication you should wait to taper off your medications for a few months. Again, do not do this yourself!!! You MUST get your doctor to oversee this drug removal. If your doctor does not know much about parathyroid disease and is unsure about this... print this page and take it to them... and if you are one of our patients (the Norman Parathyroid Center), have your doctor call us to discuss it. GERD (Acid Reflux). The symptoms of GERD and acid reflux are usually quite dramatically gone within the first 2 weeks following surgery but on occasion can take a few months to resolve. Patients who are taking anti-acid medications (Zantac, Prilosec, Pepcid, Tagamet, Nexium, Prevacid, Protonix, Aciphex, Axid) can usually stop these medications after their very first doctor's visit following the parathyroid tumor removal. Headaches. Some people with hyperparathyroidism have severe headaches that occur every few days to once a month or so. Almost all patients with headaches will have a dramatic elimination of their headaches within the first 2 or 3 weeks of a successful operation. This is often very dramatic! Heart Arrhythmias. About 8% of patients with hyperparathyroidism have heart troubles (almost always this presents as a rhythm problem--arrhythmias, atrial tachycardia, PACs, etc). Usually, a medication is prescribed for this arrhythmia. If the arrhythmia is due to the high calcium level, then it will almost always subside within a month or two of parathyroid surgery. Again, do NOT stop your heart medications until you talk to your doctor (cardiologist?) about this... but, DO print this page and take it to your doctor--because he/she may not be aware that your parathyroid problem may have CAUSED the heart rhythm problem. Hair Loss; Thinning Hair. Most women who have thinning hair due to parathyroid disease notice a difference within 3-4 months. At 6 months, they are usually quite excited to have their old hair coming back. Osteoporosis. By now you know that patients with parathyroid disease will eventually get osteoporosis...unless the parathyroid tumor is removed early enough. We have an entire page on osteoporosis (go there), but let's summarize it by saying: 1) there are NO drugs that can prevent or improve osteoporosis in patients with hyperparathyroidism as long as the tumor is still in their neck, and 2) once the tumor has been removed, ALL patients will gain bone density beginning HOURS after the surgery (that's one of the reasons why we put our patients on high doses of calcium right after the operation!). Hi Dr. Norman, On May 26th, 2009 you performed a parathyroidectomy on me. The surgery was very uneventful and ordinary for you (16 minutes, out of the hospital about 1 hour later) but was absolutely life changing for me. The higher level of energy and greatly reduced hours of napping have been a real plus. My husband says things that would have "set me off" before I now handle without upset. (I'm not so crabby!) And several of our friends have said they see a real change in me. In fact one told me just yesterday that even my voice has a sound of joy in it. That comment reminded me of your statement in the letter you sent my doctor, "These tumors take away the joys of life", and that is oh so true! It took everything I had just to exist but after surgery, when the symptoms lifted quickly, the change was amazing. Perhaps the thing I appreciate the most is the clarity of mind and how wonderfully well I read and comprehend. Other people didn't notice that so much but to me it seems like a miracle! I have a zest for life because a huge fog has been lifted! I tell people, "I'm not twenty again but I feel so much better and I don't feel like I have one foot in the grave". Uncommon symptoms of hyperparathyroidism. These two items are listed for completion sake. Old articles (from the 50's and 60's will list these stomach ulcers and pancreatitis as symptoms of hyperparathyroidism. High levels of calcium in the blood can be dangerous to a number of cells including the lining of the stomach and the pancreas causing both of these organs to become inflamed and painful (ulcers and acute pancreatitis). However, we've seen well over 15,000 cases of hyperparathyroidism and we've seen pancreatitis and stomach ulcers very few times. We won't even discuss it here any more. Too uncommon. Hyperparathyroidism and the risk of developing OTHER types of cancers. New studies have become quite convincing that untreated hyperparathyroidism can increase a persons risk for developing cancers in other areas of your body. Previously this section of the website caused too much stress in patients reading this page, so we removed it. We struggle with putting this here again, as it has been said we are "scaring people to get an operation". Well, that is clearly not our goal. We have plenty of patients and don't need to scare any more into coming to our clinic. This website (Parathyroid.com) is the most widely read resource for parathyroid disease world-wide. Our goal is to provide expertise and information so that patients can talk about these issues with their doctors and make intelligent decisions about their health. The facts are that most doctors just don't know much about hyperparathyroidism. There is now quite convincing evidence from a number of studies which show that prolonged high calcium levels (possibly prolonged PTH levels) increases the risk of developing other types of cancers. We have selected 5 journal articles that are very recent and published in major medical journals by some very respected scientists at some very large universities world-wide. The evidence presented here is that untreated hyperparathyroidism increases the risk of breast cancer, prostate cancer, and to a lesser extent, colon cancer and kidney cancer. We present here the title of the articles and a link to the journal abstract that you can read for yourself. This does NOT mean that all the women with hyperparathyroidism will get breast cancer. It does mean, however, that the risk of developing breast cancer is higher if you have hyperparathyroidism and you should take this into consideration when making a decision about what to do. The association with prostate cancer is even more troubling. Serum calcium and Breast Cancer risk: results from a prospective cohort study of 7,847 women. Cancer Causes Control. 2007 Aug;18(6):595-602. Epub 2007 Apr 5. Showed increased risk of breast cancer in women with untreated hyperparathyroidism. (This has been shown in 6 studies that we are aware of). A dramatic increase in the rate of aggressive Prostate Cancer was shown several years ago, but most recently in 2008 it was shown in a very large study in the US in cooperation with the National Institutes of Health (NIH). High calcium and PTH are associated with a 2.7-fold increase in aggressive prostate cancer. Read the abstract of this journal article here: Cancer Epidemiology Biomarkers & Prevention 17, 2302-2305, September 1, 2008. where they summarize by saying "These results support the hypothesis that high serum calcium or a factor strongly associated with it (e.g., high serum parathyroid hormone) increases the risk for fatal prostate cancer". And, you can read about it here on Yahoo also: High blood calcium tied to lethal prostate cancer. The association between primary hyperparathyroidism and malignancy: nationwide cohort analysis on cancer incidence after parathyroidectomy. Endocr Relat Cancer. 2007 Mar;14(1):135-40. Showed increased incidence of breast, colon, and kidney cancer in patients with hyperparathyroidism. The severity and complications of hyperparathyroidism are measured with the calendar, not by how high the calcium is. It is how long you have had calcium levels above 10.0 that is associated with the complications of this tumor, not how high the calcium gets. Waiting until your calcium gets higher to do something about is not based upon the facts of this disease. We have never seen anybody with hyperparathyroidism for 25 years, they have all died from the complications of this little tumor. We have blog on this topic. If you made it this far on this very long page... then please watch this video so you understand where these symptoms come from. And please, do not elect to avoid parathyroid surgery based upon how you feel, or how high your calcium has become. You either have a parathyroid tumor or you do not. Remember, the typical patient has had this disease for several years (average about 5 years) before it was ever found...because it does bad things silently. Even if you believe that you do not have any symptoms of parathyroid disease, it is taking a toll on your nervous system, your kidneys, and your bones. It may be taking away some of the best years of your life because you have lost energy and feel run-down. Get your bad parathyroid gland removed, but find an expert in parathyroid surgery. Our patients frequently say that "It was the 20 minutes that changed my life!". >It could be the 20 minutes that saves your life. Read about the MIRP operation and watch the video--parathyroid disease is cured in less than 13 minutes. Read about how to become a patient at the Norman Parathyroid Center. Read over 2,000 stories of patients who came to our center for surgery. See a map of where our patients come from (some are probably your neighbors!). 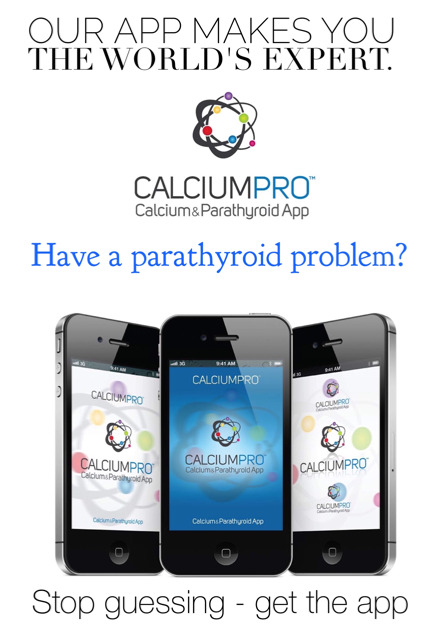 Download the Calcium-Pro, 5-star-rated parathyroid app made by our experts. Use the little icons at the top of the page to share this information on Facebook, print this page, or email this page to a friend or doctor.